This is a new game I have invented, like a much-extended noughts-and-crosses or tic-tac-toe game. It has special moves, a changeable size board, and other rules you can change to suit. Try to beat the computer! What makes the game a lot more interesting than noughts and crosses is that you can set the width of the playing area (the game-space) - the number of squares or cells in each row - and you can also set the number of dimensions to anything from two up to five (the current limit). The name of the game represents the game-space that can be played in, and can be changed to suit the specific setup of a game. So the "n" represents the number of dimensions, and the "m" represents the length of each row. Therefore the standard game of noughts and crosses is played in a 2D3 game-space. A sample image of a game in progress. 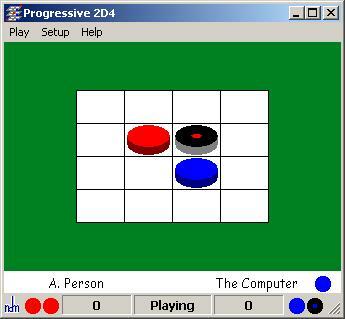 This is a 2-dimensional game, with a 4-wide grid, so it is a game of 2D4. This is a Progressive game, which is shown on the title bar. Note the markers on the status bar showing the next two moves for each player, and the marker for the current move next to "The Computer". On most computers the cursor also changes to show the current move to be made. Note also the black block piece. My personal preference is to play progressive, reverse 2D4 with wild pieces - it's a good combination. The basic AI for the computer player is now ready! Pit your wits against it - see if you can beat it! The game now has sounds for various events. Keep checking for changes, as the game is once again under development and updates will be being posted from time to time. I am also working on solving the bugs in it! Any relevant feedback or comments on nDm would be greatly appreciated. Note that the help file is in the process of being built, and will be updated again sometime. Also, there is a large to-do list and a list of known bugs still waiting for tuits to turn up. There is also a list of ideas which may or may not be incorporated into the game. I can't promise to answer every email and probably some requests will be in the to-do or known bugs or ideas list already. Please make sure you mention "nDm" in your subject line, or I may lose your mail in the pile of *$%@^ spam I have to block every day, like many of you do. To contact me, mail me at (you know what to do).